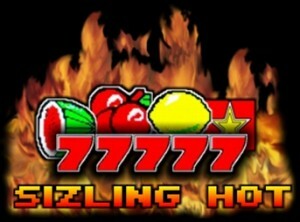 Sizzling 6 (Coolfire) is a brand new approach and the newest release in the Sizzling Hot games series. At first glance, Sizzling 6 resembles more to Mega Joker than the original Sizzling Hot. With a closer inspection, we find out that the platform used is different. This particular version uses Coolfire instead of Novo Line or Impera Line. It's also obvious that the classic 5x3 reels were dropped in favor of 6x3 reels. This is not new for the video slot genre but it is certainly new for the Sizzling Slot. Symbols used are fruits, stars, sevens, and the joker symbol. The Scatter Symbol in Sizzling 6 is the star symbol and it can form a winning combination indifferent of its location on the 6 reels. The Joker Symbol substitutes for all other symbols except the Scatter. With so many new additions it's clear that winning potential has been tuned up. The addition of the 6th extra reel allows for never before seen winning heights. While the classic version rewards 5000 on a 100 bet per spin, Sizzling 6 rewards 100 000 for a winning combination of 6 highest pay value symbols on the same line. Beside the 6th reel, Novomatic also introduced the jackpot for 18 identical win symbols. It's called the bonus win and rewards the player in the following way. Filling the screen with any fruits symbols rewards the prized 100 000 credits jackpot. To claim this the player must get for example 18 lemons. Getting 15 identical symbols from the left reel to the right rewards much less, 10 000 credits. Collecting 12 fruit win symbols rewards 4000 in bonus winnings. Click to play Sizzling 6 online. Opens in a new tab. We liked the addition of new features and the 6th reel. The hype of getting a 6 symbols combination win is there, however, it's a much rarer event than previously thought. In about 4 hours of playing Sizzling 6 the famous 6 win combo only happened once. Turns out this version is especially popular in the United Kingdom. So many new features and a visual rework made Sizzling 6 barely recognizable. In some funny way, Sizzling Gems is more relatable to the Sizzling Hot series than this one. The design and sounds were completely changed making it more an average slot game with fruits rather than a special edition of Sizzling Hot.